Small oil painting on wood panel reinforced with an oak panel. Signed lower left of a monogram (perhaps "b"). French School of the 19th century. With its beautiful period frame in wood and gilded stucco (gilded, small accidents, a missing wand). Size of the painting: 18.5 x 35.8 cm. Frame size: 33 x 50 cm. The wood panel is bent (twisted). Hand delivery possible paris 9th. 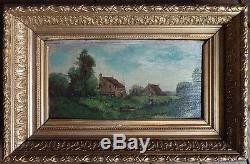 The item "19th century oil painting signed with period painting" is on sale since Friday, May 9, 2014. It is in the category "art, antiques \ art of the nineteenth and before \ paintings, enamels ". The seller is "vakano" and is located in / in paris.